Chicken Cacciatore made in a the Instant Pot! The easy Italian sauce is hearty and chunky, loaded with chicken, tomatoes, peppers and onions ( sometimes I add mushrooms too!). 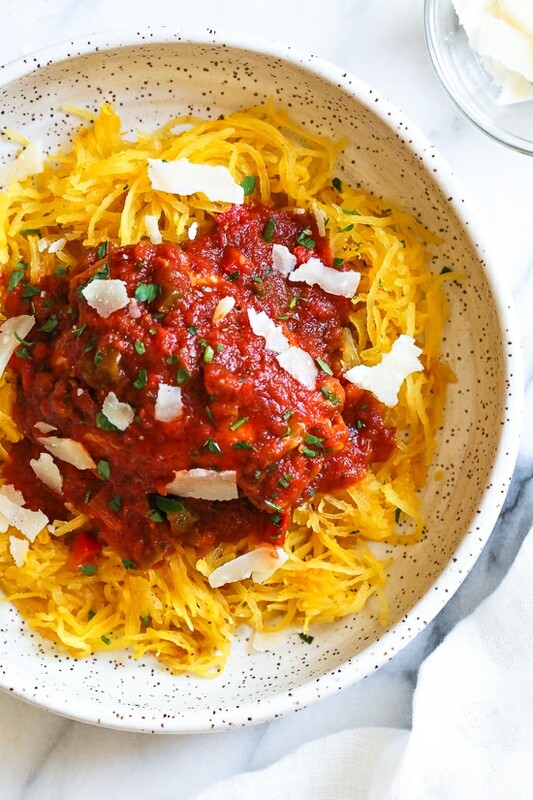 Great over pasta, roasted spaghetti squash, rice or polenta. 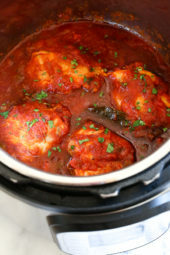 I also have a traditional chicken cacciatore recipe made on the stove and a slow cooker chicken cacciatore recipe. 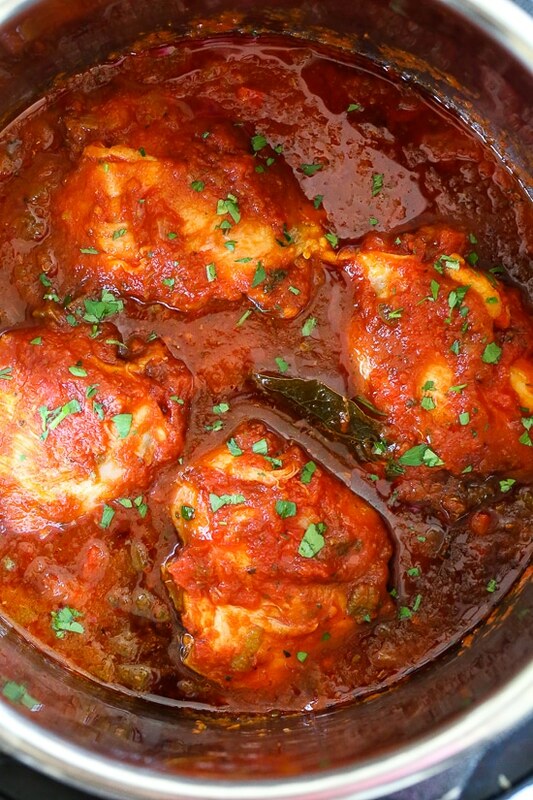 Growing up, I was always happy when my Mom was making chicken cacciatore. We would eat it over pasta or noodles with lots of fresh grated cheese on top. It’s pure comfort food to me, and I always makes me think of Mom when I make it. This month I am trying to skip my carbs during the week (80/20) so I served this over spaghetti squash for me, and pasta for the family. Although this works with any part of the chicken, I prefer to use lean skinless chicken thighs, on the bone. The chicken comes out so juicy and tender, and the bones add flavor to the sauce. Click here to see more Skinnytaste Instant Pot Recipes. 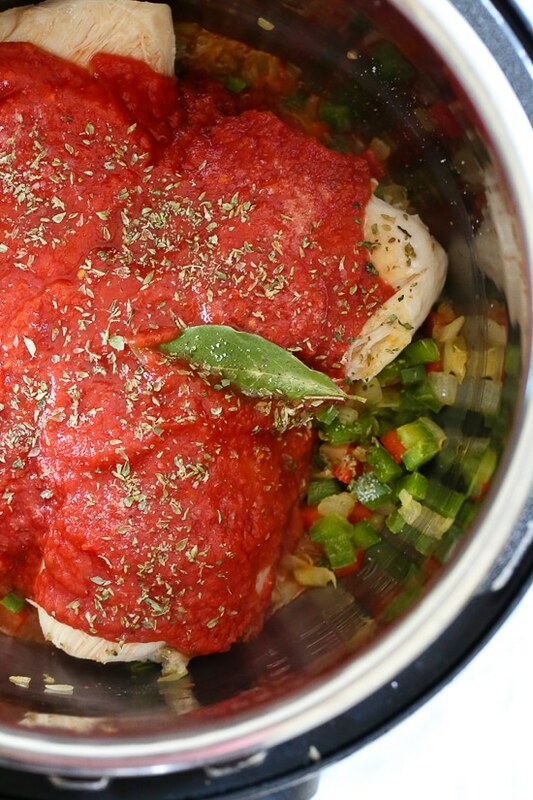 Chicken Cacciatore made in an Instant! The sauce is hearty and chunky, loaded with chicken, tomatoes, peppers and onions ( sometimes I add mushrooms too!) Great over pasta, squashta, rice or polenta. Absolutely delicious! My new favorite recipe! Hi, glad I found your site! I have a question on the step when you say cover and cook – do I change it from the sauté setting to poultry and high? Made the recipe and followed Rena’s suggestion. Felt it still could have used a bit more flavor. Half of a 28 oz can (14oz) or half a 14 oz can (7oz)? I made it twice. The first straight as given and served it with basmati rice. The second I added mushrooms and served with pasta. Both delicious. I am wondering how chicken thighs need 25 minutes to cook in a pressure cooker! these would cook in about 12-15 minutes and be wonderful and they only need a 10 minute natural pressure release, then release the rest of the pressure by opening the valve on the instant pot. Is it 1/2 of a14 Oscan? I want to add that this was especially disappointing, as I usually love Gina’s recipes. I deglazed the pan with about 1/4 c of chicken broth, so no burn notice…But no pressure either and, as I said previously, the bottom was burned. If her bottom was burned her IP would to have come to pressure. I believe that is safety mechanism. I made this tonight just as written (no additional water). It never came to pressure and burned on the bottom! 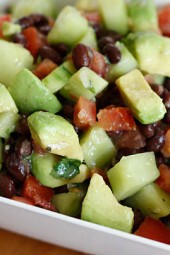 I made this last night and it was a hit —even for my picky eaters! I did replace chicken breast for chicken thighs, since this is what I had in hand. It was so so delicious! Will passata work as well as crushed tomatoes? How long would I cook this with boneless, skinless chicken breasts? Looks delicious, so excited to try! Any advice on how to alter the recipe if I don’t have a pressure cooker? I have the Ninja IQ Cooking system so i can Slow Cook, Stove Top Sear/Sautee, Steam, and Bake. Really want to make this for the super bowl next weekend! Made this last week and it was delicious!! Had it over angel hair for the kids and zucchini noodles for the adults. I am so thrilled to see all these great Instant Pot recipes. Super easy to make and super easy clean up-a win win! I got an Instapot for Christmas (IP-DUO80 V2) 8qt and decided to give this chicken cacciatore a try for the first time using it. So delicious!! Followed the instructions to a T. Used boneless chicken thighs and added mushrooms when sauteing the onion and green pepper. I was a little concerned about the amount of liquid reading other reviews, and noting that the user manual said to always use 18oz regardless. I didn’t add any additional water, just the 14oz of tomatoes as called for. No issues! Note: pressure cook for 25 minutes and natural release took exactly 20. This was my first recipe that I made in my instant pot! Once I figured out how to get the valve to work it was amazing! I like the taste of this so much better than the crock pot version. To me, everything in the crock pot tastes the same. With this everything kept it’s own flavor. We loved this and I would defintely make it again and again. My husband thought it tasted better than a restaurant. I accidentally used the whole can of crushed tomatoes instead of half and I’m glad I did. I doubled up the bay leaf and oregano and it was all used on our spaghetti squash. There were no leftovers. This is delicious! Another awesome recipe. I kinda just LOVE Ms. Gina and all things SkinnyTaste. I am not the cook in this family- my husband is- but he has zero interest in eating healthy- and yet again, this SkinnyTaste recipe tastes so great he doesn’t even realize it’s low cal. Thank you for all these great options! Can you advise how to cook it without a pressure cooker? Can I double this recipe? Will it be too much in the 6qt pot? If yoir chicken or beef is ever frozen it still takes the same amount of cook time. But simply will take a little longer to come to pressure meaning it will display “on” for a little longer. When the display changes from ON to minutes, then you know cooking has begun. Have you made this with frozen chicken? If so, what is the cooking time? Hi, I’ve seen more than one question asking about cooking time if the recipe is doubled or say 2 1/2 X. I don’t want to experiment and ruin the chicken. Can anyone divulge, including the author what their results were and the amount of time for increased quantity?? How does it turn out if the chicken is not browned? Does it taste similar if it isn’t browned. Thanks! I always brown it, but it would be fine if you don’t. It’s the same cook time if you double. I added mushrooms and some sliced pepperoncinis to the pot before cooking. I also released the pressure after about 15 minutes instead of waiting for it to natural release and the chicken was perfect. I took the chicken out and used the saute mode to reduce the sauce a bit. Served it over spaghetti squash. Delicious! Oh I HAVE to give this recipe a try! It looks sooo good. thank you! I have a 3 qt instant pot and have made this recipe multiple times without any issues. When it’s finished I always remove the chicken and add a flour thickener and saute for about 5 minutes. Then replace the chicken, stir, and serve over pasta. Last night I cooked a double recipe in my new 6 qt pot and instantly got the burn message. I have NEVER added water because the sauce is so runny. I got so frustrated after stirring and it happened again that I turned off the 6 quart and made two batches in the 3 quart with no problems. Now wondering if I should take back the 6 quart pot. I found this recipe UNDERWHELMING – First, I think it is very poorly written. It never states to deglaze the pan, or put the chicken back in after doing so. Then there is NO thin liquid for the pot to build pressure hence a “burn” notice waiting to happen. In addition, directions say to stir everything together. The photo shows the tomatoes on top and tomato products should NEVER be stirred in when pressure cooking. I made this as written with the exception of putting in 2/3 cup of chicken broth so the pot could come to pressure, and layering tomatoes on top of the chicken. Hence the sauce was watery (but I don’t feel it would be possible to pressure cook without the broth), and the flavor was bland. I’m now sorry I bought the cookbook. The chicken cacciatore I grew up with have kalamata olives in it. Do you think they will turn to a gross mush in the IP? I want to make sure the flavor is still there but i’m thinking adding them later in the cook time will a) still leave them mushy mess and b) not deliver the flavor that I’m looking for. Any suggestions? I would not cook them but would add them to the sauce as soon as you open the lid of the IP. Stir them in and let them stew for a min or two. They would still be quite tasty and would not be cold this way. Same with sliced green olives, also very yummy. I made this last night in my 8qt Instant Pot. Doubled the recipe as far as sauce/etc. but only added two more chicken thighs.I tried not adding any extra water, thinking the sauce all around the crushed tomatoes would suffice. I was wrong. I got the burn error pretty immediately. First i tried using the plastic spatula to scrape the bottom and make sure nothing was stuck. Started it again and got the burn error again. At that point I added around two cups of water and stirred it well. This did the trick and the recipe completed. While the recipe was cooking I did some research online and found that the 8qt pot seems to be notorious for this burn error and much more sensitive than other versions. I also learned that tomato based “liquids” aren’t thin enough and can’t count as the liquid. For 8qt users, liquids/layering are pretty critical and letting the pan cool a bit after using saute was recommended as well. At the end, everyone still loved the recipe – just sharing this info in case anyone else is making it with an 8qt. Next time I’ll probably put 1.5 cups of water in first instead of 2 and hope that is enough. The sauce does end up runnier (as another reviewer mentioned) but I pulled the chicken and sauteed for a bit which helped deplete some of the extra water — and it tasted great so even without the thickness, it’s a keeper. This was good! I used the recipe as a base, added 8oz sliced mushrooms , diced Carrot, dried tomatoes, garlic, fresh thyme and rosemary. For the tomatoes, I had some frozen canned and frozen roasted from the garden, so I blended them and used about 16+ oz. Boneless, skinless thighs and cooked for 20 minutes, natural release for 10. Leftovers should be great! Yum! So easy to make in the Instant Pot. Made a double batch of it last night and just made Shakshuka (steamed 2 eggs on top of sauce/chicken mixture) for 14 minutes. The yolks overcooked, but I could’ve shaved a few minutes off. Delish! Thanks for the new week-day go-to! 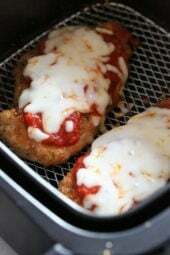 I want to make this tonight but I only have chicken breasts. So with those would it be 0spts? Thank you! Do you have a “Manual” button? If so, just press that button and add or subtract time to accommodate the recipe. The “manual” button is the pressure cooker button. Do you have a “manual” button? If so, press that (it’s the pressure button) and key in your desired time….for this recipe, 25 mins. 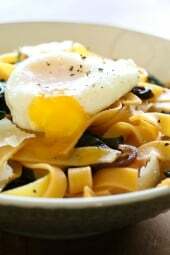 Hi,I have been enjoying your recipes and often make them (for the first time) when my kids come for dinner. Sunday I made this for the kids (grown) and my neighbors and everyone loved it. I made it the day before and then heated it in a large skillet, adding a little red wine and stirring in a little cornstarch mixed with chicken broth.. Served it over roasted spaghetti squash. 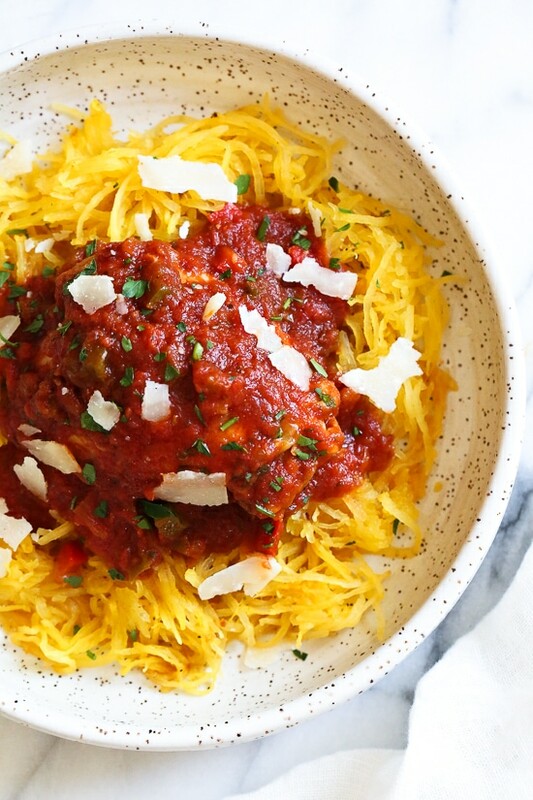 I want to try this recipe but I have the Instant Pot Ultra 6 qt and is says to use 2 cups of liquid when cooking, but your recipe only calls for crushed tomatoes. Will that be enough liquid or do I need to add more? I have the instant pot ultra and it says to use 2 cups of liquid when cooking, but your recipe only calls for crushed timatoes. Do I have to also add other liquid? Does doubling this recipe change the cook time? I made this recipe. I did add some extra spices like Gara masala, cumin, cayenne pepper. I did get the dreaded BURN notice. So, I opened it up and added a cup of water. I got the burn notice too. Do I just need to add water the next time? I took it out and finished cooking it on the stove. My IP gave a burn notice when I cooked it the first time. I ended up dumping everything into a bowl, cleaning the IP, layered the bottom with sliced mushrooms (I’d forgotten to add them the first time, so it was serendipitous), then layered on the chicken, then dumped the sauce back on top. Didn’t stir. It worked fine. The second time I made it, I didn’t stir after adding the tomatoes and it worked just fine. Didn’t have to add water either time. How can this recipe NOT produce a burn notice with no water or thin liquid in the pot? I’m scared to try it. The crushed tomatoes are liquidy enough. My mom and I have both made it in our Instant Pots and have never had a Burn notice. I’ve also made Gina’s salsa chicken which uses just salsa, no water…and the salsa I use is thicker than the crushed tomatoes and I’ve never had a Burn notice for that either. Good luck! Pressure cookers force liquid out of the meat, too. My IP gave a burn notice when I cooked it the first time. I ended up dumping everything into a bowl, cleaning the IP, layered the bottom with sliced mushrooms (I’d forgotten to add them the first time, so it was serendipitous), then layered on the chicken, then dumped the sauce back on top. Didn’t stir. It worked fine. The second time I made it, I didn’t stir after adding the tomatoes and it worked just fine. Your IP will stay on “keep warm” mode unless turned off. This definitely ruined it. I would like to make this, but my instant pot pressure cooker doesn’t go past 4 minutes. Is it broken? Are you sure? Which button are you pushing? No the crockpot version of the instant pot does not have a manual function and I believe the lowest it will go is 5 minutes. But I don’t see where this recipe requires anything but 25 minutes? Love this recipe! I make this at least once a week. I love how easy it is to tweak and still comes out amazing each time. Now I just use the entire can of crushed tomatoes and the entire pack of chicken thighs which is typically 6. No tome to Brown the thighs? No problem- it still tastes great! I ordered chicken cacciatore from an Italian restaurant recently to see what “real” chicken cacciatore tasted like and this recipe was MUCH better! If I’m using boneless, skinless chicken breasts, will the cooking time still be 25 minutes with natural release? Delicious! I pureed the sauce after cooking because it seemed watery and I knew my toddle wouldn’t eat the pepper pieces. Win-win, it thickened up a bit and my toddler loved it, as did the rest of the family! Can I use the slow cooker instead of the presser cooker. How long would input it on for and is everything else the same… thanks. Hi! Can you please confirm how long we should let the IP naturally release pressure before removing the lid? If I double the recipe in my Instant Pot will that change the cooking times? This might be a weird question, but which instant pot do you use? I’m looking to buy one after seeing all of the times that you use yours, and I don’t know anything about them. I LOVE all of your recipes. Wow, the chicken was so tender. Amazing recipe. I added 4 cloves of garlic and used fresh plum tomatoes (put tomatoes, peppers, garlic in blender). I also added a tbsp of Worcestershire, 1 tbsp of balsamic vinegar, 2 tbsp of white sugar (because of fresh tomatoes), 1 – 7oz can of tomato paste (also because of fresh tomatoes), 1 tsp red pepper flakes, 1 tsp onion powder, 1 tsp garlic powder and 2 tbsp butter.This is going to be a regular dish in our house. I will add some of your additions next time, Norm. I always normally add Worcestershire, balsamic, sugar and tomato paste to my normal recipe (non-IP recipe) and didn’t even think of it this time. Don’t know why. I was just tuned into this recipe and completely forgot lol. Hope it is still tasty. I also used chicken breasts, and added water because I have to have so much liquid in my 8 qt instant pot. When I went to cut up my chicken to eat, it just started shredding. I used red, orange and yellow bell pepper… so with that and the the shredded chicken, I made an open face sandwich with a little melted mozzarella… Makes a great sandwich too!! Could you make this up to step 4, cover and pop the insert in the fridge and then pressure cook it later? I’m trying to find alternatives for quick dinners with my crazy busy family! I made this tonight, and it was great! I added the mushrooms. Will definitely make it again. I made this tonight with 4 boneless, skinless breasts instead of thighs. I added about 1/2 to 3/4 cup water based upon other reviews. I will NOT add water in the future. It was still delicious, but it was super watery. My husband loved it and went back for seconds. It will definitely be on my “make again” list. How long did you cook in the instant pot for the boneless skinless chicken breasts? I used boneless chicken breasts and cooked for 5 minutes. It was a tad dry, so next time i might limit the browning at the beginning to 1-2 minutes per side. I always recommend chicken thighs since breast’s are always dry (even in the crock pot). They are tender, in that, they shred easily, but taste dry. Always!